For the longest time kimchi was one of those things I was too scared to try. It's contents were strange and the methods of creation dubious. Traditional Korean kimchi (for those who have yet to be indoctrinated into its delights), often made with cabbage, radishes, or cucumber fermented along with raw shrimp, octopus, or fish. Don't get me wrong, I LOVE raw sushi, but I don't feel in the least bit qualified to try fermenting seafood on my own. As someone of European background with two German grandmothers and one Polish grandfather, fermented cabbage (i.e. sauerkraut) was not at all a foreign substance. I know they're loaded with probiotics and stuff that's good for gut health. But kimchi... well I hadn't even heard of it until a few years ago. My dad, on the other hand, will eat almost anything. And a few weeks ago during a dinner at his place he served us kimchi as an appy. 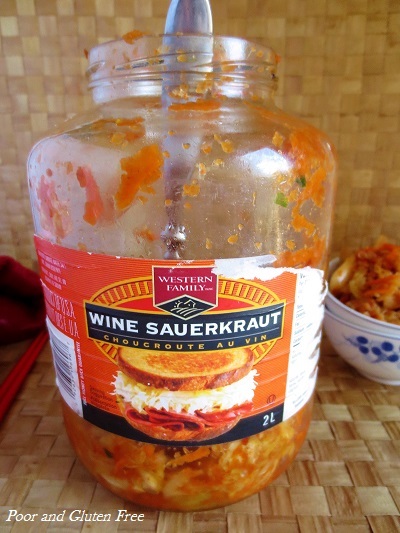 My husband, who is not keen on most other fermented foods, really liked it. So of course I had to try to make it myself! And you know what? It's super easy and doesn't require a lot of fancy stuff. Kimchi is also very, very healthy. 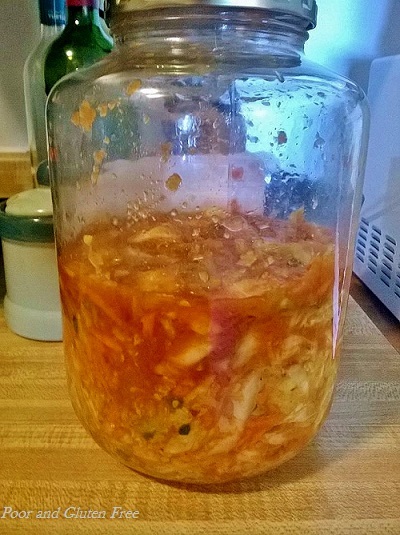 It's high in probiotics, and next week I'm going to post an article on probiotics and whether or not heating them is a good idea, but this week let's start with the Kimchi recipe! Kimchi has a ton of variations, and there doesn't seem to be one true recipe, so I don't feel too bad that I just mashed a bunch of recipes together to try and make this one. Most of the ingredients are things that you can find easily, and don't require a trip to an Asian market. Traditional kimchi is often made in a large clay pot and buried under the ground to ferment. You don't need to do this! I put mine in an clean glass jar (fittingly, I used a large old sauerkraut jar I cleaned out!) and left it on the counter for a couple of days. So as I said, the recipe is super flexible. I combined several and just used what I had in the kitchen. You can add shredded cucumber and / or radish if you like, or take out the carrot. You can add more or less spice, depending on your taste. This recipe is fairly spicy, but those who like heat might want to add even more! The most time-consuming part is just waiting for it to rest in the salt. I give this about 2 hrs, tossing part way through. 1) Cube the cabbage, or chop into chunks or shred. Sprinkle with 1/2 the sea salt and toss. Let sit 1 hr. Sprinkle with remaining salt, toss, and let sit 1 more hour. Rinse and drain the cabbage. 2) In a food processor or blender, blend garlic, onion, ginger, scallion, apple, soy sauce, fish sauce, smoked paprika, and hot pepper flakes into a paste. 3) Toss cabbage and any optional additions with paste, until well-coated. If needed, add a tablespoon or two of water to thin paste. 4) Press down into glass jars, pushing with the end of a spoon or chopstick to push out any air bubbles. Ensure the cabbage is coated with paste. You can eat this right away, or start fermenting now! Once it's good and stinky and bubbly, move it to the fridge to slow the fermentation. This should keep for at least a month in the fridge, if not longer. If white spots or mold begin to grow, personally I wouldn't eat it. So what can you do with your kimchi now? As an appy, with crackers, olives, etc. Kimchi pizza is next on the list! And stay tuned for next week, because I'll be posting an article on whether or not heat kills probiotics, and if that's a bad thing. What's your favourite fermented food? Looks amazing- great photos! Will it work without the hot pepper flakes? Want to serve it to kids??? I don't see any reason why it wouldn't work without the hot pepper, I don't think it's needed for the fermentation. I have found actually that over time in the fridge the spiciness has died down. It seemed strongest the first couple of days. If you try it, let me know how ti goes! Oh cool! I had always wondered about this! 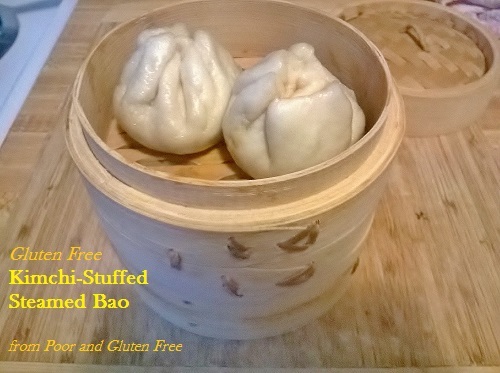 Thanks for sharing :) Healthy and easy! 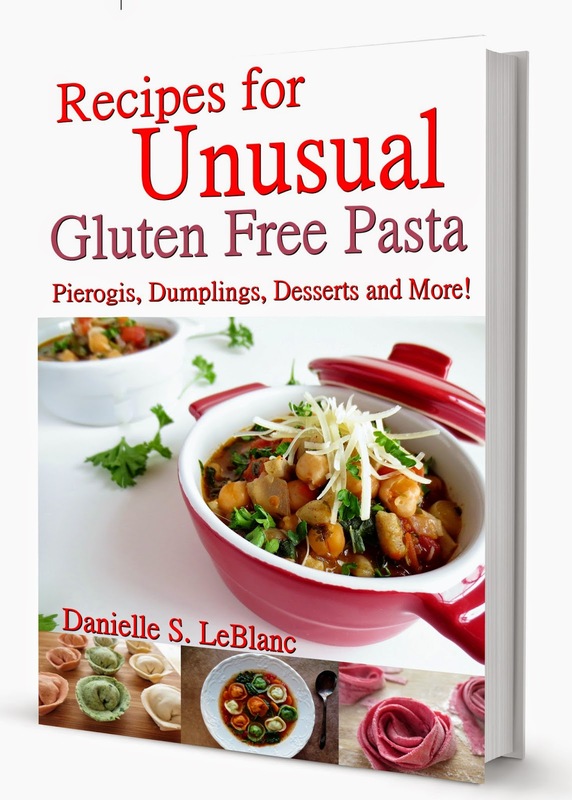 I cannot have fermented foods but this truly does look delicious! Wish I could give it a try! 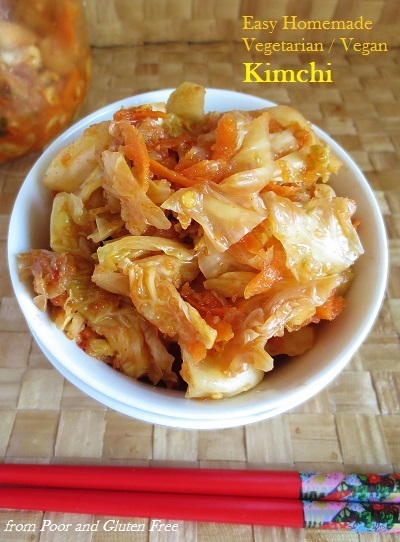 I love Kimchi but have never made it wow that looks good thanks for linking up with us today! Thanks! It's super simple and flexible :) And thanks for hosting and stopping by! Never had kimchi before but this is the second recipe of our linkup this week featuring kimchi, so maybe I ought to give it a try! Thanks for linking up with us. I love kimchi! Who can resist these delectable ingredients? There is something so satisfying about this spicy homemade kimchi! 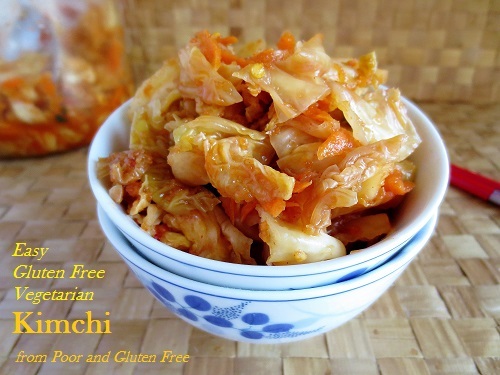 Thanks for sharing your healthy and delicious Easy Homemade Kimchi with us at the Healthy Happy Green and Natural Party Blog Hop! I'm pinning and sharing. Thanks for sharing, Deborah! And yeah, kimchi is kind of addictive!